It’s no secret that I have a fascination with Korean beauty products. In the past year, K-beauty has become a popular trend in the US and products are more readily available. 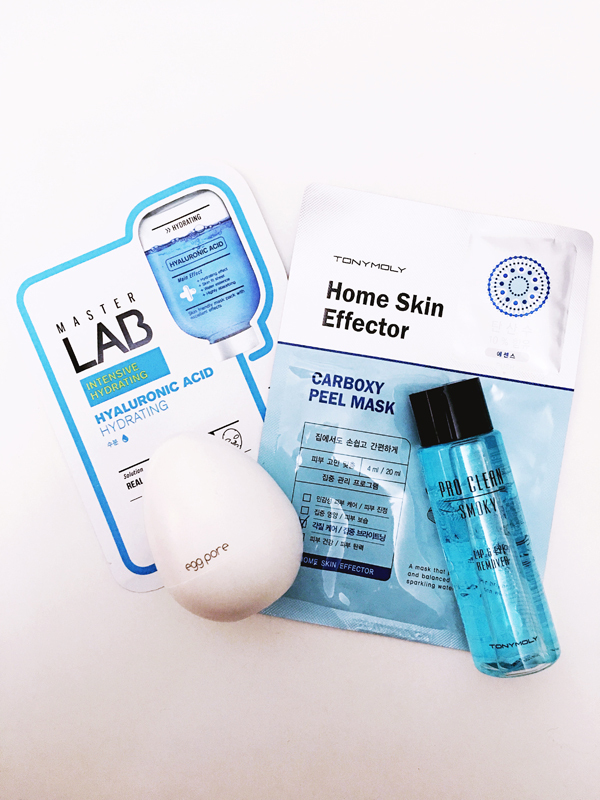 Whether you’re looking for a snail mask or a blackhead pore pack, TONYMOLY is the place to hit up for all your K-beauty needs. Above & below are a few of my favorite products I picked up at my last TONYMOLY stop in Koreatown and from a new fave Korean skincare brand, Earth Therapeutics. Master Lab Hyaluronic Acid Hydrating Sheet Mask – I use this ultra-hydrating mask 2-3x/week and it is by far my favorite purchase from TONYMOLY thus far. This mask is not only easy to use (e.g Doesn’t slide off your face if you move), but it also works to give your skin a hydrating boost overnight. Egg Pore Blackhead Steam Balm – This balm claims to clear aware blackheads using egg white and camellia extract to melt away impurities. While my skin definitely feels smoother after use, this balm isn’t something I am dying to repurchase. If you are someone who is prone to blackheads it’s worth the $10 but if it isn’t a big skin concern, no need to spend the money. Home Skin Effector Carboxy Peel Mask – The carbonic mask is intended to brighten your skintone using AHA and BHA to melt dead skin cells and while it seems amazing in concept, unless used regularly you won’t see a huge difference. Like many products, this is one you have to repeatedly use and even then, the results are so minute that it’s hard to rationalize purchasing again. Pro Clean Smoky Lip & Eye Remover – Not all makeup removed are created equal. This lip and eye makeup remover is not a one and done product and instead takes a lot of product and some major scrubbing and tugging. No thank you! Intense Care Syn-Ake Hydro-Gel Mask – Dull skin need a little boost? This hydro-gel mask contains active ingredient Syn-Ake (a pseudo peptide that mimics real snake venom) to improve skin’s elasticity while moisturizing. Intense Care Snail Hydro-Gel Mask – This sheet mask made from snail mucin is my second favorite hydrating sheet mask besides the Master Lab one above. If you’re looking for a mask that provides both moisture and anti-aging benefits, this mask is a great fit! 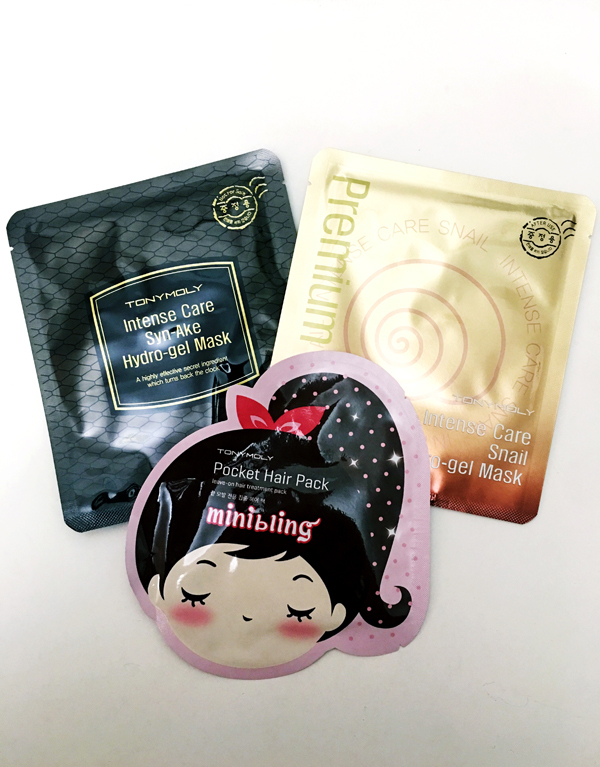 Minibling Pocket Hair Pack – I really wanted to be able to recommend this hair pack, which claims to prevent or repairs hair damage by proving intense nutrition, but unfortunately it fell flat. Literally, my hair was flat and greasy after use. 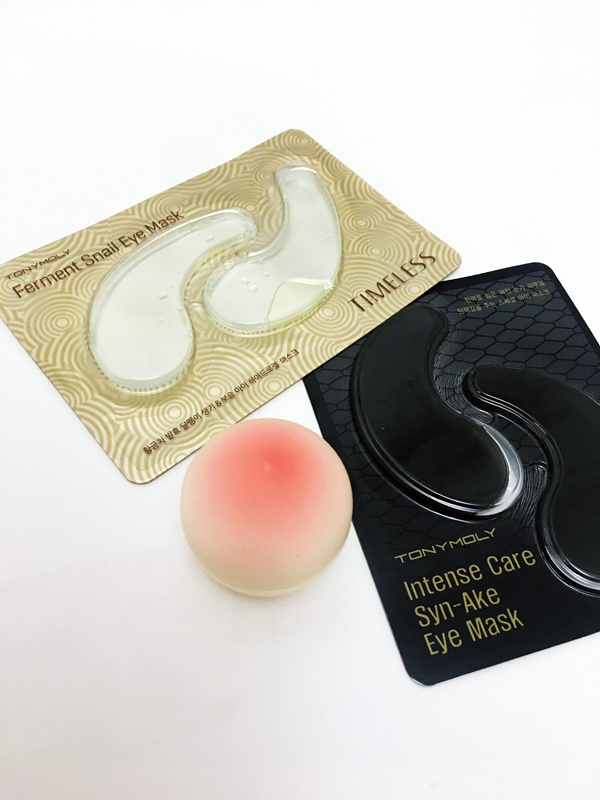 Ferment Snail Eye Mask – Under-eye skin is so thin that it sometimes needs more moisture than the rest of your face. These ferment snail extract gel pads pack a big moisturizing punch but be sure to give yourself time to lay back and relax because they do a lot of slipping and sliding. Intense Care Syn-Ake Eye Mask – Just like the sheet mask above, this eye mask boasts the same anti-aging/moisturizing claims but be sure to buy a stack because you will need to use 2-3x/week to see any improvement. Mini Peach Lip Balm – I can’t even begin to tell you how good this lip balm smells! I have to be honest and say this was an impulse purchase at the checkout because of the cute packaging an heavenly smell. Does it really moisturize your lips? Questionable. Does it smell like you just ate a juicy peach? Why yes it does! Earth Therapeutics Retinol Cleansing Facial Towelettes – These ultra-soft cleansing wipes gently and effectively remove makeup without irritation and unlike traditional makeup wipes, these also tone and resurface your skin’s texture. 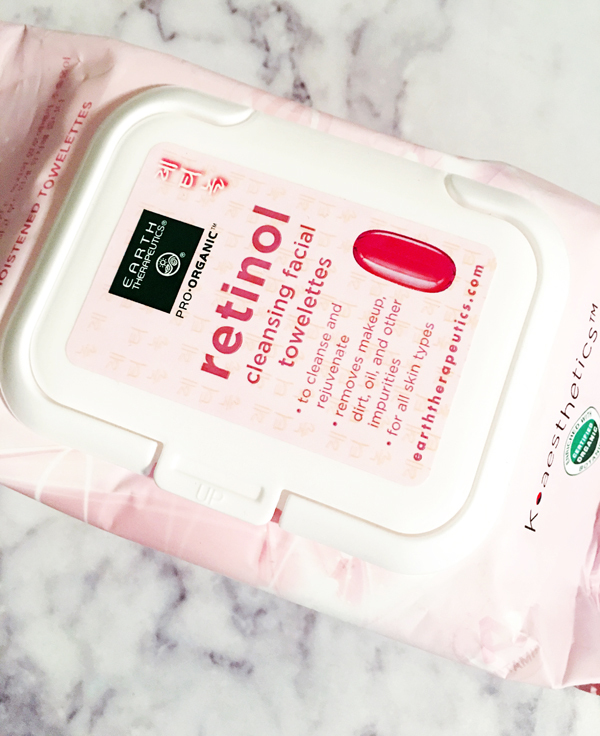 If you are looking for an effective makeup wipe that has added value, pick up a pack of these retinol wipes, Earth Therapeutics’ Tea Tree pack or Collagen wipes.